After losing 120 pounds, Christopher Sims, 31, is doing things he once never imagined, such as completing a total of 20 marathons and half marathons to date, becoming captain of the Atlanta run club Movers and Pacers — and starring in two commercials for NIKE. Yes, NIKE. The prominent sports brand that has endorsement deals with professional athletes like LeBron James, Rory McIlroy, Cristiano Ronaldo and Kobe Bryant. Once tipping the scales at 300 pounds, the JSU alum disclosed that he had been overweight for a significant portion of his life. Receiving his bachelor’s in biology from the HBCU in 2009, he moved to Hattiesburg for graduate school where his weight continued to balloon. “I grew really depressed and got bigger and bigger,” said Sims, now a clinical research coordinator in Atlanta. The change did not go unnoticed by Sims’ mother who told her son he needed to scale down. Sims embraced clean eating. He eliminated fast food, soda, bread, pork and beef from his diet. He also incorporated daily workouts into his regime. Over an 18-month period, the weight whittled away, and a slimmer, health-conscious runner emerged. In 2015, during his weight loss journey, a friend introduced Sims to the Movers and Pacers Run Club. “I was not a runner, and everyone was fast. I was always left behind,” he admits, but also insists that consistency is vital. In May 2017, the Jackson native was crowned long distance captain. In March 2018, a director for NIKE reached out to Sims via Instagram after following the runner’s story on social media. Looking to showcase a male person of color, the director asked Sims if he would be interested in shooting a commercial. “At first, I thought it was someone pranking me,” Sims said, but despite his skepticism, he gave the director his phone number. Soon after that, a producer at NIKE contacted Sims to discuss the layout of the commercial and the rest was — lights, camera, action. The NIKE production team flew from New York to Atlanta, and Sims found himself in a 17-hour shoot. “They called on a Monday, and the commercial was shot on a Saturday. It all happened so fast,” he said. The commercial aired two weeks later. Then, according to Sims, NIKE asked if he would shoot a second advertisement and a week thereafter the production team returned to Atlanta. Unfortunately, Sims mother did not have the opportunity to see him gracefully glide across the television screen. She was tragically killed in a car accident in 2017. But his younger brother, Ashonte Coates, a senior at JSU, cannot help but voice the pride he has for what Sims has accomplished. “He doesn’t let anything stop him from doing what he wants to do. I look up to him for that. He doesn’t take no for an answer, and I try to model my life the same way,” said Coates, who also declares that his brother is the reason he attends Jackson State. 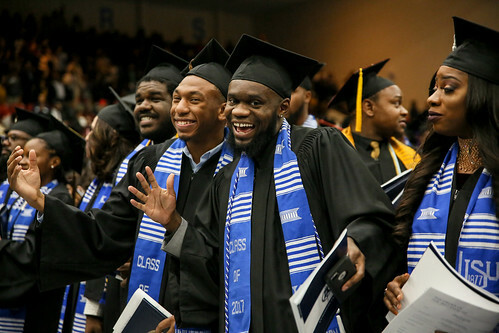 Sims describes his time at the HBCU as “the best four years of my life.” He also credits his biology professor Anita Patiolla for going above and beyond to ensure that he would be a success in life. “I love JSU and the ambiance of togetherness on the campus. It was definitely a family environment. I felt safe and like I was supposed to be there,” said Sims, who also holds a master’s degree in public health from Kaplan University and a master’s in health administration from the University of Arizona.